Great Colonial home for rent. Heated Pool. Long open views. Private location. This is a summer rental Memorial Day to Labor Day weekend. Can be rented for the winter @ $3,500 per month. New Paint. Open Kitchen to dining room area. Nice size living room. First floor bedroom and full bath. Second floor master bed room. Guest room with full bath. Summer of 2018 Summer rental for $35,000, November 2018 is Rented. Call for more info on this very unique home. Available: 06/01/2019 - 09/03/2019 - $35,000 for term - Spend this summer immersed in the beauty of Litchfield County at this newly renovated 5-bedroom, 5-Bath home. A sprawling floor plan offers a spacious layout with the Eat-In Kitchen, Living Room with Fireplace, and Dining Room at the center of the home as well as a Gym, Office, 2 first floor Bedrooms, and a Family Room with fireplace, span the first floor. Three additional en-suite Bedrooms upstairs, including a Master with large walk-in closet and Master Bath with soaking tub, and a Laundry closet in the hall complete the upper level. AVAILABLE MAY 30 -JULY 30, 2019 @ $35,000. Designer Home in top Washington location. Featured in Elle Decor and CT Cottage and Gardens. Large open kitchen/great room, formal dining room, office, living room, play room/media room, main floor master. Gorgeous flat land with fabulous gardens, pool, uber cool tree house. AVAILABLE SUMMER 2019 (please call for current availability and pricing). This beautiful log cabin is set on Twin Lakes and overlooks the Berkshire Mountain range to the west. Recently renovated, this furnished, waterfront home has 3 bedrooms, 2.5 baths and a great room with a gas fireplace and vaulted ceiling. Enjoy lazy, summer days relaxing in the hammock, lounging on the private dock, or walking the beautiful and quiet surrounding country roads. The stone terrace is a great place to end your day, where the gas grill and wood-burning fireplace make it the perfect spot to enjoy a warm summer night with family and friends. The house boasts central air, cable, and wi-fi. Pets to be determined. AVAILABLE JULY 8 - 31, 2019 @ $30,000. Enjoy 3.5 weeks in pure luxury at the 50 yard line of Lake Waramaug, the most prestigious lake in CT. Walk down to the town beach. Enjoy views of the lake and abutting Hopkins Vineyards. New construction with every possible amenity. Heated pool with cabana. 5 bedrooms. Large screened porch and multiple decks for enjoying the outdoors. Open floor plan with gorgeous gourmet kitchen. Also avail for $10,000 per week. Available: (Memorial Day Weekend - Labor Day $30,000) - (June 2019 - $10,000) - (July 2019 $12,500) - ( August 2019 $12,500) - Restored Colonial with gunite pool and pool house. 3 bedrooms and 2.5 baths. Chef's kitchen. Short distance to Mudge Pond, hiking trails, Mohawk Mountain and everything beautiful Litchfield County has to offer. Pool, Lake, views; what more could you ask for?!?! This adorable lake cottage truly has the best of both worlds as you can swim and boat on one of the most pristine, private, and picturesque lakes in all of Connecticut; or go for a swim in your own private pool. The house shares 125' of the best lake frontage on all of Waramaug. Lake front is flat has a dock and has spectacular sunsets views. Also enjoy spectacular sunrise views from the house and large wrap around deck! Open living room/kitchen. 3BR, 2BA with an additional room in the basement. Can sleep 8 comfortably. Fully furnished. Available for the entire summer. Inquire for pricing on July or August only rentals. Or rent Yearly for $2,700/month! Agent Owner. This is the perfect retreat to relax and enjoy summer in the country. Bring your friends and enjoy dinner on the deck while watching the sunset over the pond and then watch the fireflies dance in the night. Artistically renovated shingle style home sitting on nearly 60 acres of land surrounded on three sides by CT State Forest. The property is secluded and very private with two streams- one with a waterfall and yoga platform, a swimming pond, gardens both perennial and vegetable, fruit trees. Two miles of private trails meander through the woods allowing you to connect to the Mohawk Trail and hike for miles right from your back door. The home is warm and inviting with two large fireplaces and a large cook's kitchen with island and pantry. The kitchen opens to the living room with a huge native fieldstone fireplace and French doors that lead to a deck with western views. There is a cozy library with fireplace to get away and enjoy a book or a movie. The house has 4 BR and 3 Baths and one Suite on the Main Level has a separate entrance. 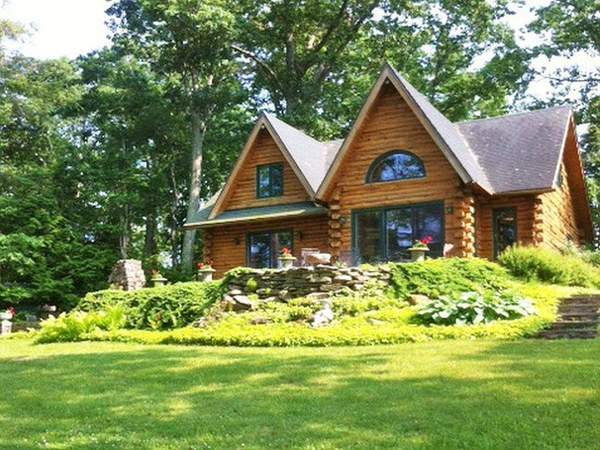 Come and enjoy nature and the outdoors at this idyllic retreat located on a dirt road next to the Housatonic River just outside of the village of West Cornwall. AVAILABLE FOR JULY OR AUGUST FOR $10,000 EACH MONTH. Sharon Mountain Sunset Views - Stunning Sharon Views with Amazing Sunsets. This 4 bedroom, 5 bath Colonial on 30 open acres is private but not secluded. Only 2 miles to town and close to Sharon Beach. Within 10 -15 minutes to Lakeville/Salisbury, Millerton & Amenia. Watch sunsets from the sunporch, enjoy the garden bursting with berries throughout the summer, read a book in the gazebo, have fun & friendly competition on the croquet lawn, or nighttime smores at the fire pit all make for a perfect summer escape. AVAILABLE MAY 17 - SEPT 2, 2019 @ $30,000. All new Lakefront cottage with 120+/- feet of coveted Lake Waramaug frontage. Uber chic design. 2 bedrooms + a fully insulated & heated sleeping porch that can be used as a 3rd bedroom. Luxury amenities include: quarter sawn oak floors, 2 terraces, custom closets, top-of-the-line kitchen, beautiful stone fireplace, Rocky Mountain hardware, & extensive outdoor lighting. Take your boat for a cruise on the lake or enjoy lounging on the new dock with pergola. This is the perfect spot to enjoy all that the lake and New Preston have to offer. Easy walk to the beach and extensive Steeprock hiking trails. Parking for up to 6 cars. Tenant pays for weekly lawn care and house keeping. Landlord pays for pest control, additional gardening and alarm service. Private Post & Beam yet Conveniently Located - Available: June for $8,000, July for $10,000, August for $10,000, and Memorial Day - Labor Day for $25,000. This 2005 Timber frame, 4 bedroom Sharon home is Stunning and Immaculate! It boasts a 25-foot vaulted ceiling, multiple French Doors leading out of the living room, kitchen and first-floor master bedroom to an expansive deck with mountain views. The stylish open floor plan boasts wide board wood floors, spacious first-floor master bedroom en suite and a chef's kitchen ideal for cooking with family and friends. The living room is warm and welcoming with a striking floor to ceiling brick wood burning fireplace. Quality construction abounds throughout the entire house. The second-floor family room with a second wood burning fireplace is cozy and also enjoys a vaulted ceiling and great light. There are three additional bedrooms and a full bath. Large unfinished basement could be easily converted into finished space and already has beautiful French doors bringing in lots of light. Conveniently located between the towns of Sharon & Lakeville and only 15 minutes to Wassaic train station. Only minutes to Millerton, Hotchkiss and Salisbury Schools and central to skiing at Mohawk and Catamount. This home is an absolute winner! GRADUATION WEEKEND & AUGUST RENTAL with POOL Country Living at its best in this renovated 1880 Estate in Sharon. The house features 7 Bedrooms and 5.5 Baths as well as a Chef's Kitchen and breakfast room, formal Living and Dining Room, Family Room and Study along with a fun-filled Game and Media Room. This light-filled home has beautiful gardens, stone walkways, and a bluestone Terrace facing the back lawn. The newly built Screened-in Porch overlooks a heated gunite Pool for those lazy summer days. Just a short distance from the Sharon Village Green, Salisbury/Lakeville, CT, Millerton, NY, and the Wassaic Train Station. Also, just a few minutes to some of Connecticut's most beautiful rivers and lakes for swimming, sailing, fishing, and hiking. Enjoy fabulous restaurants, shops and breathtaking scenery. May 29 - June 2 for $800 per night / August $22,500. Woodridge Lake Summer Rental for 2019. Furnished 4 bedroom 3 bath home. Very light and bright wth hardwood floors and open floor plan. Walk/bike to club house for pool, tennis, or beach area and all of the WLPOA amenities. Basic cable and internet included. Short drive to Litchfield. Lease, security deposit, references a must. No pets. $20,000/month of July - $20,000/month of August - Fabulous Lake Wononcopomuc Main house with 3 bedrooms and 3 full baths. The large living room boasts a wood burning fireplace and open floor plan to kitchen/dining room all overlooking the lake. The perfect lake house for family and friends to get together. Lovely large wrap around porch and lower level patio are ideal for outdoor relaxation. The lower level has a family room with pool table and easy walk out to quickly get out to the expansive lawn and down to the lake. The guest house has a bedroom with 2 twin beds and a queen bed in the open living room. Kitchen set up for light meals and privacy from the main house. An ideal space for guests. Available July or August at $19k per month.. Gorgeous Barn Style Home with Pool on Level acres, Open Floor Plan and patio for great entertaining..Metro North/Wassaic station just 12 minutes. quiet and private setting, just minutes from Kent and Sharon Centers in Ellsworth Area of Sharon. Game Room with Pool Table. Granite Fireplace with Beamed ceiling in Living Room. Gourmet Kitchen, Master Suite with Cathedral Ceiling, his and her Master Bath, Walk in Closet, 5 brs, 3 Ensuite. Private guest or in law apartment. Beautiful Pastoral Area,... The ultimate in Vacation Homes! Private, quiet summer retreat with heated Gunite pool and mountain views located less than 2 hrs from NYC. Open floor plan with 2 master suites, including one on the main floor, a guest bedroom on the main floor and an overflow bedroom with full bath in the loft. Cook's kitchen, Great Room with wood burning fireplace. High ceilings, large windows and a spacious deck with beautiful northwestern views. Only 5 minutes to the town of Kent with excellent restaurants, bakery and shops. Available July and August - 18K per month or Memorial Day weekend thru Labor Day for 54K. Call for details. AVAILABLE @ $17,000 for JULY 2019. Endless Views in South Kent. Light filled rooms and expansive living spaces. Open chef's kitchen with counter seating , dining area and fireplace. Living room with fireplace and media room. Newly painted and updated. Minutes to the many shops and eateries in Kent Center and Villages of Washington. State parks land trust hiking trails nearby. Also available $5,000 per month thru Memorial Day. Tenant pays for weekly pool and lawn care. Classic 1900's Adirondack style lake home filled with charm. This home sits privately away from the road and has beautiful views over Lake Washining, the larger of the Twin Lakes. Well appointed interior with wood floors, wood burning stone fireplace and four bedrooms, including a master suite with a wall of windows looking at the water. There is a screened porch, dock and cabin with foosball table. The perfect summer retreat. Available may and June for 12,000 per month or July, August and September for 16,000 per month.